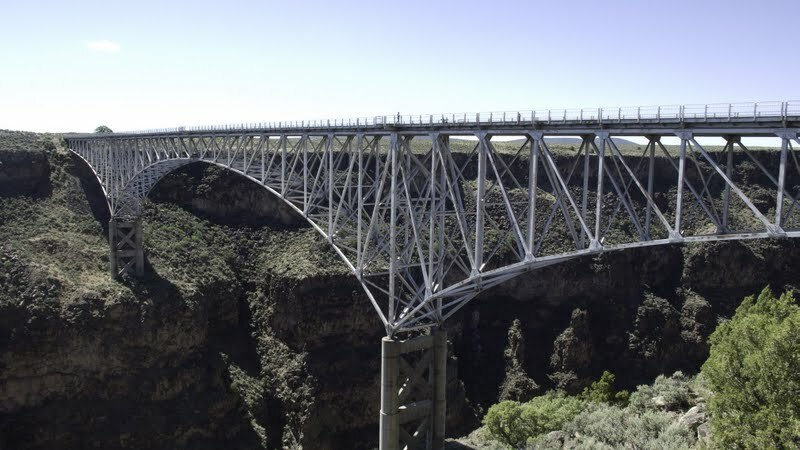 The Rio Grande Gorge Bridge is a cantilever truss carrying New Mexico State Route 64 over the Rio Grande River. The bridge is 650' tall with 300' approach spans and a 600' main span. It was built in 1965 and voted the most beautiful long-span steel bridge by the American Institute of Steel Construction. This bridge is a popular location for filming movies. On the day this photo was taken (in June of 2008), workers were getting ready to close the bridge to shoot a scene in Terminator 4. The bridge is 10 miles west of Taos and less than a mile east of Spaceship Earth, a desert community with many unique, energy efficient homes. The bridge has sidewalks that allow visitors to study the Rio Grande Gorge, an earthquake rift zone where stresses between the Pacific and the North American Plates cause occasional earthquakes. If a large earthquake were to occur, this bridge would be extremely vulnerable since it wasn't designed to resist much shaking or a possible offset if the rift were to open. Arch Bridges: The Rio Grande Gorge Bridge by Mark Yashinsky is licensed under a Creative Commons Attribution 3.0 United States License.